Curry-Ya. Curry No for me. I make my own Japanese curry at home. You know, the chunky powder stuff you buy from Asian grocery stores, chop your own veggies and meat and boil in water to create your own sweet gooey goodness. So when I was presented with an opportunity to eat at Curry Ya, I was skeptical from start to finish. I'm thinking..why would I pay $10 for a bowl of curry I can make at home and sure their ingredients are more complex but it's basically the same. I was not happy with my $12 plate of curry with steak, mushroom, onion but I ate it all anyway 'cuz it cost $12! $12 for curry. I had my doubts. Menu recommended Yuba Salad. Tofu skin and green beans topped with parmesan cheese and olive oil. Ground meat style curry which was decent. I went to the James Perse sample sale today which is the last day of the sale. Sooo...there were racks and racks of soft comfy wear for women and even men. I was looking for khakis and luckily, I find the last pair of pants I wanted in my size on a lonesome rack in the back, at 80% off, tried it on and bought it! That was my only purchase and thought maybe I should have gotten more cottony softness when I saw people hoard bags full of tank tops, shirts and dresses...good for them! The sample sale took place in the heart of Chelsea market which I've come to adore since the opening of so many new interesting shops, markets and restaurants. Truly a foodie's paradise. I got a French baguette from Amy's bread and restrained myself from buying cupcakes. I also got a choco-latte made with fresh chocolate milk from Ronnybrook farm in Upstate NY. I bought some fresh pate from Buon Italia, an Italian import store (http://www.buonitalia.com/) and Grapeseed oil for cooking from a gourmet supermarket. 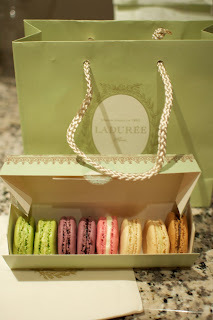 Ladurée- A sweet piece of Paris in New York. I arrive to Ladurée on the Upper East Side and was greeted with a queue in front of the store. Blogs warned me of this. The store opened no more than three weeks ago and people are craving a piece of Paris on their taste palette. I was especially intrigued by the fact that they import all their deserts including macarons, chocolats, biscuits, candies, jams and jellies etc. directly from France. Since I was in search for the best macarons in NY and also having never set foot in Europe, getting birthday sweets for myself was the perfect excuse to venture out there (or twenty six blocks from my work). A lineup, mostly chicks + bfs. $62 candles. I stopped myself from licking them. Smelled so nice and sweet. I just want the box. Macaron buffet. $2.70/each more if you want to pair with fancy boxes. They sell out on different flavors on a daily basis ...for now. 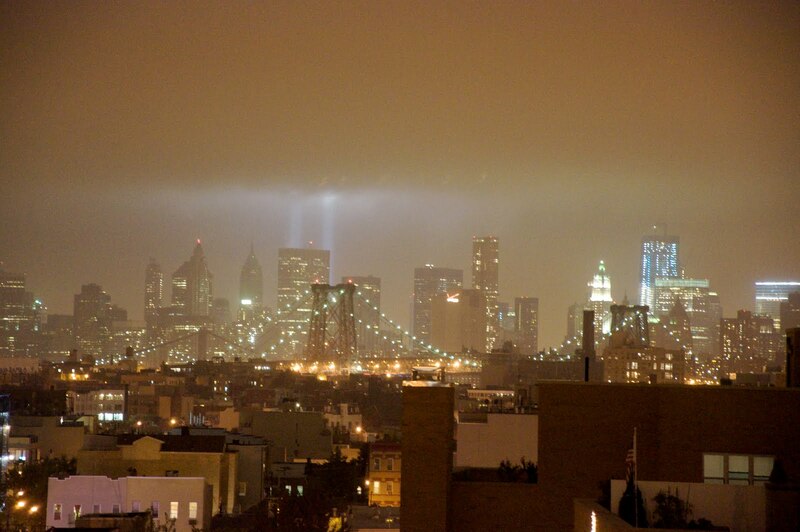 Tribute to September 11. NY skyline - 10 years later. I can't believe what happened to this city 10 years ago...I am glad that a decade later, the city has recovered and the phantom lights are back up to pay tribute to 9.11.